Questions about travel logistics or your hotel reservation? Please contact Jaime. Enjoy a free cooked-to-order breakfast at the hotel with hot and cold items such as eggs, signature custom omelets, pancakes, cereal, fruit and pastries. 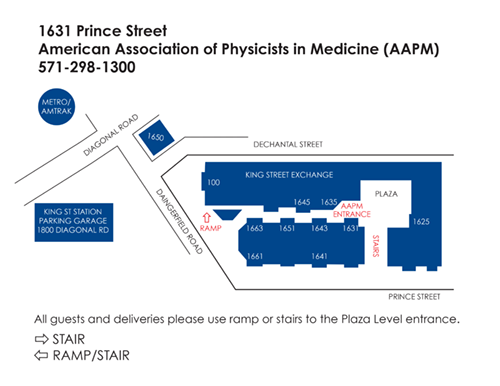 Coffee and tea will be available at AAPM HQ. Breakfast will not be served at AAPM HQ. The closest metro station to the hotel is King Street (yellow or blue line) which is 2 stops from Reagan National (DCA). The fare is approx. $2.00 one-way, depending time of day, transit time is approximately 10 minutes. We suggest you take the blue line. Due to maintenance on the yellow line, trains will be running on an off-peak schedule of every 24 minutes at times. Let Jaime know if you intend to drive. Limited free parking is available, but special arrangements need to be made. If a free parking space cannot be secured, you will be reimbursed for parking at the Embassy Suites.